Straight up, y'all, I was really disappointed by this book. It was lying on a cart at the library at the end of an aisle, as if it was calling to me! One glance at the title and I was hooked. Who wouldn't want to… um… do it yourself psychic power? Nonsensical title aside, the cover promises "practical tools and techniques for awakening your natural gifts." From this I expected, you know. Practical tools and techniques. Instead, O'Sullivan spends fully half of the book explaining preparations you should take. Meditation, opening chakras - basically, an awful lot of "sitting quietly and thinking about things." I imagine that if you really did follow all of the rituals and proscribed meditations, you could easily spend every day fully booked with that kind of thing. 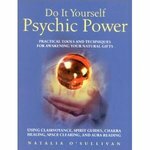 Read more about Natalia O'Sullivan, "Do It Yourself Psychic Power"